Even as it closes in on full employment, today’s economy is not providing stable, decent employment with standard hours and employer-provided health insurance to all working-class people. That is why the basic floor of protection provided by the Supplemental Nutrition Assistance Program (SNAP, sometimes called food stamps) and Medicaid are critical. SNAP and Medicaid help ensure that all families, including ones with adults in low-paying jobs working often-erratic schedules, have access to decent nutrition and health care. SNAP and Medicaid are already largely worker-assistance programs. For example, more than 14.8 million workers received assistance from Medicaid in 2016. Recent proposals for introducing new work tests for these programs are punitive and would actually put barriers in front of recipients looking for stable work (such as involuntarily underemployed workers seeking more hours of work), rather than helping recipients conduct effective job searches. Strict monthly work tests (which revoke benefits after just one month of failure to meet work requirements) ignore the reality that labor markets for low-wage workers exhibit lots of “churn” and erratic hours. This churn would leave far too many workers vulnerable to failing these work tests in a given month. Churn and instability of hours are outcomes of policy failures (such as the failure to provide paid family and sick leave) and employers’ power to demand that workers submit to last-minute scheduling and other unfair practices, not of some lack of motivation on the part of workers. While the work-hours tests often could be met in theory by undertaking work or job training, current proposals (such as the House-passed farm bill) provide grossly inadequate funding for job-training programs. If half of recipients not meeting the work-hours test in a month tried to seek training, the House farm bill would provide enough resources for those recipients to have just one meeting with a job counselor and attend one job club. Heavy-handed and punitive work tests for SNAP and Medicaid will do little to nothing to boost the employment possibilities for low-wage workers. Policymakers seeking more effective ways to boost stable employment should reject work tests and instead consider policies that aim to make work pay better and that provide work supports such as paid leave and child care. Most SNAP and Medicaid beneficiaries are children, people older than 65, or people with disabilities (Lauffer 2017 and Jarosz and Lee 2017)—groups that most Americans agree should have a social-protection floor without being required to meet individual work tests. When it comes to nonelderly, nondisabled adults, SNAP and Medicaid are already mostly worker-assistance programs (i.e., more than half of nonelderly, nondisabled adult beneficiaries are working). SNAP supplemented the wages of workers in nearly 7 million households on average each month in 2016 (Lauffer 2017). In 2016, more than twice as many workers—roughly 15 million—reported turning to SNAP at some point in the 12 months before they were surveyed as part of the American Community Survey (Lauffer 2017). SNAP households include adult-only households and households with children. In 2016, most households with children receiving SNAP included one or more workers. Among all nondisabled, working-age adults who received SNAP in 2016, nearly three out of every four were employed or were recently employed (Lauffer 2017). Both SNAP and Medicaid show clear evidence of supporting a higher share of workers over time. For SNAP, the share of households receiving benefits that have any labor market earnings has risen steadily since 1989 (USDA 2017). For Medicaid, one key metric of its support for working families—spending on children in working households—has grown. In 1990, less than 20 percent of all Medicaid spending on children went to children in working households; by 2016, that share had increased to more than 80 percent, indicating a huge shift towards spending on working families (Hoynes and Schazenbach 2018). In SNAP, reforms that provided states with options to make their SNAP programs more friendly to families with workers have played an important role in the increasing share of SNAP households with labor market earnings. In Medicaid, the increasing support for working families is largely due to states expanding coverage to low-income workers, and program administrators focusing on Medicaid’s core mission of increasing health care coverage among low-income people. Positive and negative broader economic trends have also contributed to the increase in the share of SNAP and Medicaid beneficiaries who are employed. The positive trend is the steady decline in the unemployment rate over the last eight years. The negative trends include declines in wages and employer-provided benefits for working-class people over the last several decades (Bivens et al. 2014). SNAP also applies a controversial monthly work-hours test to adults under age 50 who are not living with children and who do not have a medically certified work disability. Adults subject to this test are limited to three months of SNAP vouchers unless they clock at least 80 hours of work each month. Unemployed beneficiaries subject to this work-hours test who are unable to get hired are at risk of losing SNAP regardless of whether they are at fault for the inability to secure the required hours. Employed people who don’t get sufficient hours to meet the test or who lose their job during the month will lose SNAP benefits unless they are able prove they have good cause for not working the required hours. People can meet the test by participating in a “work program” for 80 hours each month or in a “workfare” program for a specified number of hours. However, states are not obligated to provide either of these options under current law (Bolen and Dean 2018). The maximum value of a SNAP voucher is currently $192 a month for one person, an amount equal to 26 hours of work at the federal minimum wage. The daily value of the maximum SNAP voucher is $6.40, or less than the federal minimum wage for one hour of work. Thus, the hours of work or training required to meet the monthly work-hours test each month are disproportionate to the value of the in-kind assistance provided by SNAP. Under current law (but not in the House proposal discussed below), there is one exception that is more proportionate: people in workfare (unpaid assignments to a public, private, or nonprofit employer) can meet the work-hours test by working a number of hours equal to their household’s SNAP allotment divided by the minimum wage. But again, states have no obligation to offer such programs. In June, the U.S. House of Representatives narrowly passed a farm bill that would expand and intensify the monthly work test by 1) extending it to parents of children age 6 and over, and to adults ages 50–59; 2) taking all SNAP assistance away from people who fail the test after one month (rather than three); 3) increasing the number of hours required to meet the test (to 25 hours a week in 2028); and 4) further limiting the authority of individual states to exempt people from the test based on local labor market conditions and other factors. In theory the bill would require states to offer work programs to those who are not employed. However, as we discuss further below, the funding provided is far less than is needed to serve everyone who would need to participate to retain SNAP benefits and, thus, it is likely that states will offer work programs that are of poor quality and will do little to help people succeed in them. Medicaid and other means-tested health programs have never imposed work tests as a condition of eligibility. However, in January 2018, the Trump administration announced that it would consider granting states waivers that allow them to impose work tests as a condition of eligibility. Since then, the administration has approved four state waiver requests to impose such mandates in Medicaid; seven more requests are currently pending including from states that did not expand Medicaid eligibility under the Affordable Care Act. In June 2018, a federal district court invalidated the administration’s approval of a work-test waiver for Kentucky. The court ruled that the administration failed to “adequately consider the effect of any demonstration project on the state’s ability to help provide medical coverage….” (Meyer 2018). The details of the work-hours test waivers vary by state, but they are generally similar to the SNAP mandates. The administration’s guidance allows states to apply these requirements to nonelderly adults not receiving disability assistance. In most states, individuals would need to work or participate in work activities for at least 80 hours each month or lose coverage.7 As with SNAP, certain other intensive activities could also count toward the hourly work requirements, but absent funding for these activities, it seems unlikely that they will end up being viable options for most unemployed people. The administration has not required states to offer any work supports in tandem with instituting waivers and, in fact, prohibits them from using federal Medicaid funding to do so. They all can and should obtain stable employment with standard hours that are at least half time as a condition of eligibility for basic in-kind assistance. They should lose eligibility for in-kind assistance if they are unemployed in any month for almost any reason, or work less than the hours dictated. Their prior work; past caregiving responsibilities; health history; or recent crises, transitions, or other life experiences are generally irrelevant to whether they should lose eligibility for Medicaid and SNAP if they do not meet the work-hours test in a particular month. The public costs of administering works-hours tests in Medicaid and SNAP are reasonable and a better use of public funds and public employees’ time than less punitive and more broad-based approaches to supporting employment and advancement. As we discuss further below, these assumptions are largely incorrect. As Wilson and Jones (2018) have documented, we have “a divided workforce, with different classes of workers: Those who are consistently working full time and earning wages at or above the median; those who earn below the median and are working more than they used to—when they can get jobs—but are still working less than full time; and those who face barriers that keep them out of the workforce full time.” Job instability—including involuntary unemployment and involuntary part-time employment—and volatile hours with the associated unpredictable earnings are a fact of life for millions of working-class people. For these workers, the in-kind assistance provided by SNAP, Medicaid, and other programs is essential, and affirmatively supports work and education, as well as their health and well-being. Will monthly work-hours tests improve health outcomes? Trump administration officials have argued that imposing work-hours tests in Medicaid will “improve health outcomes.” There is good reason to believe that involuntary unemployment—not having a job despite wanting one—is detrimental to health. But there is no reason to believe that conditioning basic health coverage on meeting a monthly work-hours test will reduce involuntary unemployment or improve health outcomes. A more sensible approach to improving health outcomes would be to provide unemployment insurance and reemployment services to people who are unemployed, while maintaining health coverage to avoid any adverse health effects during periods of involuntary unemployment. Figure A, adapted from Cooper, Mishel, and Zipperer (2018), examines one indicator of job instability by looking at the degree of labor market “churn” faced by workers in low-wage jobs compared with workers in middle- and higher-wage jobs. The churn measure is what share of workers (by predicted wage level) make an employment transition (from employed to either unemployed or not in the labor force, or vice versa) at some point over either a one-month or a three-month period. 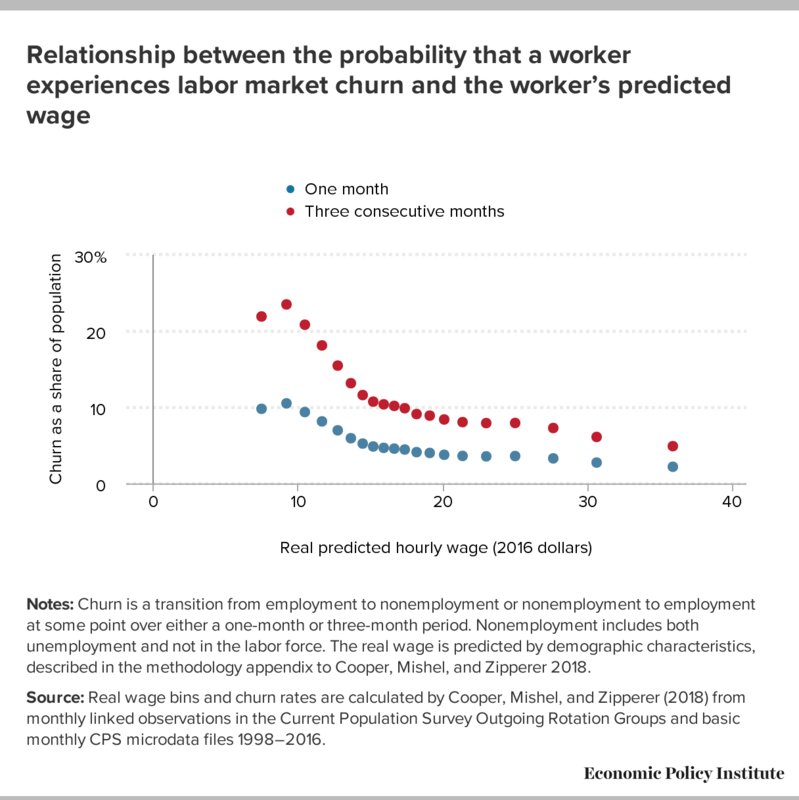 Lower-wage workers are two to three times as likely to experience churn as higher-wage workers. For example, about 1 in 10 workers earning $10 an hour makes an employment transition each month, compared with roughly 1 in 25 workers earning $20 an hour. If measured over a three-month period, the churn rate for workers being paid $10 an hour increases to one in five. Notes: Churn is a transition from employment to nonemployment or nonemployment to employment at some point over either a one-month or three-month period. Nonemployment includes both unemployment and not in the labor force. The real wage is predicted by demographic characteristics, described in the methodology appendix to Cooper, Mishel, and Zipperer 2018. Source: Real wage bins and churn rates are calculated by Cooper, Mishel, and Zipperer (2018) from monthly linked observations in the Current Population Survey Outgoing Rotation Groups and basic monthly CPS microdata files 1998–2016. 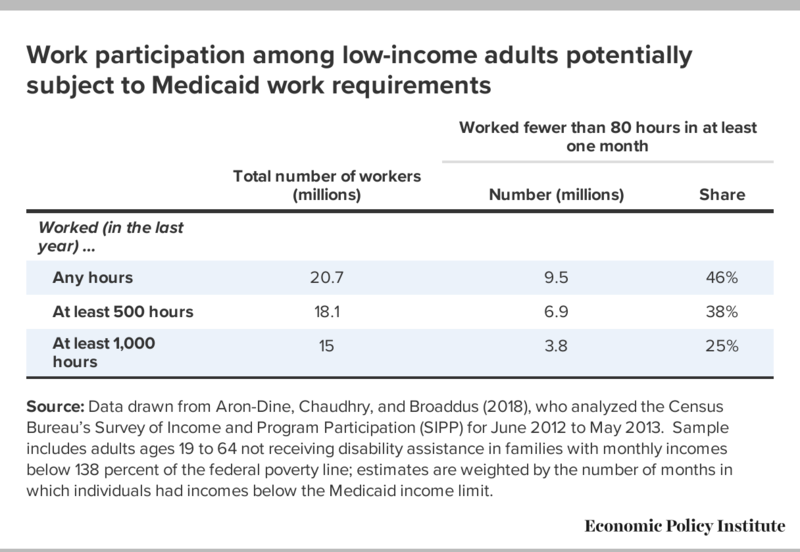 Besides providing insufficient hours, the jobs most typically available to working-class people who are likely to have Medicaid coverage or receive SNAP because of low incomes have other common characteristics that affect workers’ ability to meet work requirements (and other nonfinancial eligibility requirements). Among private-sector workers in the bottom fourth of the wage distribution, 57 percent lack paid sick leave, nearly 100 percent lack access to paid family leave, and 20 percent lack access even to unpaid family leave.10 Two-thirds of these workers lack access to health care benefits.11 Moreover, for those who have access to health care benefits, employer-provided coverage is often unaffordable or inadequate. These characteristics of low-wage and working-class jobs, combined with the lack of paid sick leave and health benefits, surely explain much of the excess churn and hours volatility we see in this segment of the labor market. For example, Hill (2013) found that providing paid sick leave substantially reduces the likelihood of job separation, particularly for mothers. Dube, Lester, and Reich (2016) found that minimum wage increases result in reduced job separations as well. Recent work by the Center on Budget and Policy Priorities (CBPP) and others has documented the extent to which low-income working people could lose Medicaid coverage and SNAP as a result of hourly work mandates. For example, as shown in Table 2, almost half of low-income workers would fail a work-hours test in at least one month over the course of the year (Aron-Dine, Chaudhry, and Broaddus 2018). This estimate excludes workers who are elderly or receive disability assistance. Source: Data drawn from Aron-Dine, Chaudhry, and Broaddus (2018), who analyzed the Census Bureau’s Survey of Income and Program Participation (SIPP) for June 2012 to May 2013. Sample includes adults ages 19 to 64 not receiving disability assistance in families with monthly incomes below 138 percent of the federal poverty line; estimates are weighted by the number of months in which individuals had incomes below the Medicaid income limit. Similarly, Acs, Wheaton, and Waxman (2018) estimate that about 10 million people would be subject to, but would not meet, the SNAP work-hours test in the proposed House farm bill in at least one month each year, and that most of them worked during the year. Proponents of work-hours tests argue that people who are unemployed or underemployed could meet the work-hours test through participation in a work or job training program. In the case of SNAP, the House GOP farm bill provides grossly inadequate funding for such programs. According to Acs, Wheaton, and Waxman (2018), if half of the roughly 10 million people “who are estimated to not meet the requirements in at least one month of the year were to seek education and training services, the average amount of federal funds available to states would be $204 per person.” Using the current value of average costs of services provided by adult and dislocated worker programs operating under the Workforce Investment Act of 1998, this is enough for a single one-on-one counselor meeting ($156) and one job club meeting ($41 per person).13 As a result, most states would likely end up operating low-quality and heavy-handed work programs that aim to make accessing SNAP more burdensome, but provide little real assistance. It is often claimed (implicitly or otherwise) that it is not the availability and conditions of work that drive employment in the low-wage workforce; rather it is the motivation of workers themselves. The claim is essentially that work is available, but potential workers are choosing “idleness” instead, potentially lured into this idleness by an increasingly generous transfer system. However, this narrative is belied by evidence showing that the number of average annual hours worked by households in the bottom fifth of the income distribution has grown far more strongly than average annual hours worked by households in general over the past generation. Table 3 below shows the growth of annual hours worked by working-age households in the bottom quintile of the income distribution compared with the average of all income quintiles in 1979, 1989, 1995, 2000, 2007, and 2016. The table shows clearly that annual hours for the bottom fifth rose significantly faster than average hours between 1979 and 2007. 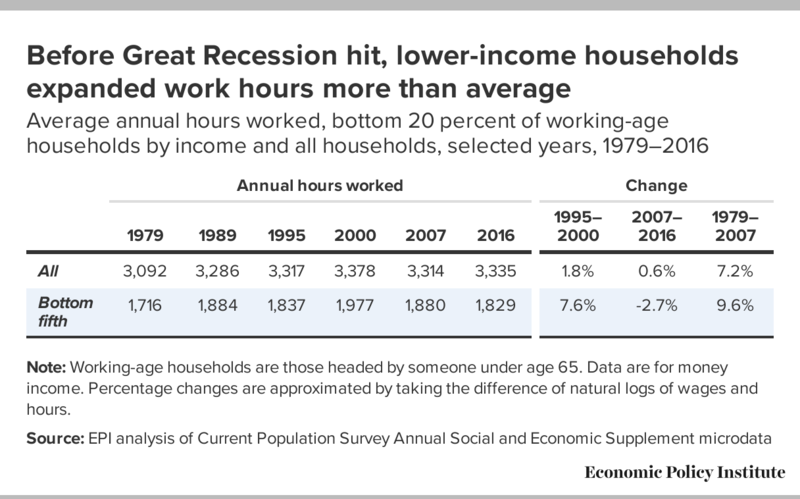 Hours fell faster for lower-income households between 2007 and 2016, but this is clearly a cyclical response to the Great Recession and slow recovery at that point. Note: Working-age households are those headed by someone under age 65. Data are for money income. Percentage changes are approximated by taking the difference of natural logs of wages and hours. But even during times of overall labor market health, large groups of potential workers can find themselves locked out of stable employment through no fault of their own. Unemployment rates of workers over the age of 25 with just a high school diploma are nearly double rates for workers with at least a four-year college degree. Even if one is willing to claim that workers’ access to educational credentials is entirely under their own control (and not conditioned by family resources or other influences), data show that labor market outcomes are clearly affected by barriers (like discrimination) that persist even during times of comparative labor market health. For example, the unemployment rate for African American workers with a high school diploma was 7.8 percent in 2017, nearly twice the unemployment rate for white workers with only a high school diploma (4.1 percent). Similarly, the unemployment rate for workers in fair or poor health in 2017 (8.3 percent) was more than double the unemployment rate for workers in excellent or very good health (3.0 percent) (BLS-CPS various years). Finally, claims that potential low-wage workers are freely choosing not to work don’t explain why it would be in their financial interest to maximize in-kind benefits by forgoing cash income from employment. There is no unconditional, means-tested “cash” assistance for unemployed people in the United States, except for the elderly and people with permanent and total disabilities. One consequence is that moral hazard in the form of people without disabilities intentionally avoiding employment is an extremely minor issue in today’s system of means-tested social assistance. As long as out-of-pocket work expenses do not exceed earnings, working always provides more income than not working for a person receiving SNAP. Moreover, the one program that does provide a form of “cash” assistance—the earned income tax credit (EITC)—is conditioned on employment. Unlike cash benefits that are sharply reduced or quickly taken away as earnings increase, the EITC is structured as an after-tax wage subsidy for workers with incomes that can reach up to a modest middle-class level. For example, the EITC for parents doesn’t completely phase out until earned income reaches roughly $40,000 to nearly $55,000 (depending on number of children and filing status). In the final analysis, imposing work-hours tests in SNAP and Medicaid will have little to no impact on employment rates in the United States and will only add to the barriers that sit between low-income workers and decent employment. Further, such work tests will distract from real reforms that would improve the health, well-being, and employment outcomes of working-class people. SNAP and Medicaid provide a basic floor of protection that helps ensure that all families, including ones with workers in low-paying and often volatile occupations, have access to decent food and health care. We should strengthen that floor rather than weaken it with punitive and burdensome tests that seem designed to fail workers. Josh Bivens is the director of research at the Economic Policy Institute. Shawn Fremstad is a senior fellow with the Center for American Progress and a senior research associate with the Center for Economic and Policy Research. 1. Super (2004) argues that most Americans think of “welfare” as a “program that possesses, or is seen to possess, some combination of the following characteristics: It (1) provides ongoing cash assistance on the basis of need; (2) [is] based on eligibility criteria that take no account of, or penalize, employment; (3) [serves] an unpopular and unemployed population that seems foreign to much of the middle-class; (4) [is dispensed] through a public bureaucracy; (5) [is] administered in a manner that seems to encourage fraud and behavior abhorrent to middle-American values.” Using an experimental survey design, Campbell and Gaddis (2016) find more support for means-tested in-kind assistance, particularly food assistance (SNAP) and child-care assistance, than for means-tested cash assistance (they did not ask about means-tested health insurance). 2. Beyond earnings, there are few other sources of income for nondisabled, working-age, working-class adults who are unemployed. Adults who lose a job may be eligible for up to 26 weeks of unemployment insurance in most states, but must have sufficient wages in covered employment in the 12 months prior to unemployment, and be able and available to work. The United States does not provide unemployment assistance or means-tested cash assistance to nondisabled, nonelderly adults without children. State Temporary Assistance For Needy Families (TANF) programs do provide short-term income assistance to some parents, but the number of parents receiving such assistance is very low (only about 500,000 in a typical month, which is roughly 1 percent of all parents living with minor children in the United States) due to onerous eligibility restrictions, and the amount of assistance provided is modest (Foster and Rojas 2018). 3. Nondisabled adults referenced in Garfield, Rudowitz, and Damico (2018) are adults whose Medicaid eligibility is not based on receiving Supplemental Security Income (SSI). Workers include individuals who are working part-time or full-time. 4. The SNAP job requirements, as set out in the Code of Federal Regulations (7 CFR 273.7), are as follows. Household members who are elderly, disabled, or caring for young children, or meet other criteria, are exempt. Nonexempt participants must accept suitable employment. SNAP considers all employment suitable unless it meets at least one of the following criteria: pays less than the minimum wage; requires the employee to join, resign from, or refrain from joining any legitimate labor organization; is at a site subject to a strike or lockout; or fails to meet state-established suitability criteria. In a few other limited situations, a participant can decline a job, including if she or he can show it entails an unreasonable risk to health and safety, or that it interferes with his or her religious convictions or observances. 5. In seven of the states, participation in the SNAP employment and training pilot is voluntary; in two of the states it is mandatory, and one state is conducting both mandatory and voluntary pilots. All of the projects target adults receiving SNAP who are required to register for work, but most target subsets of this group. For example, Georgia targets nondisabled adults subject to the current 80-hour work requirement (a monthly work-hours test applied to adults under age 50 who are not living with children and do not have a medically certified work disability). For descriptions of these programs, see USDA 2015. 6. Section 4013 of S. 3042, Agricultural Improvement Act of 2018. 7. For a summary of this state variation, see Table 1 in Musumeci, Garfield, and Rubowitz 2018. 8. Measured in terms of numbers of workers in the industry receiving SNAP and Medicaid, based on authors’ calculation using American Community Survey data from the IPUMS-USA database (Ruggles et al. 2017). 9. Authors’ calculation using American Community Survey data from the IPUMS-USA database (Ruggles et al. 2017). 10. For this number, see table 32 in BLS 2017. 11. Authors’ calculation using American Community Survey data from the IPUMS-USA database (Ruggles et al. 2017). 12. About 12 percent of nonelderly workers are union members. But among nonelderly workers receiving SNAP, less than 7 percent are union members (BLS 2018). Some of this difference is due to age, education, and other differences between union and nonunion members. But there is little question that part of the difference is due to positive impacts unions have on wages, benefits, and working conditions. In research examining the impact of unionization on compensation in 15 major low-wage occupations, Schmitt et al. (2007) found that wages of unionized workers were nearly $2 per hour more than wages of nonunion workers, while unionized workers were 25 percent more likely to have employer-provided health and pension benefits. Dube, Lester, and Reich (2016) have shown that increases in the minimum wage cause reductions in employee turnover and labor market churn. 13. To make these calculations, we take 2011–2012 costs from Mastri and McCutcheon (2015) and then adjust for inflation. 14. For example, see OECD 2018. Abraham, Katherine, and Melissa Kearney. 2018. “Explaining the Decline in the U.S. Employment-to-Population Ratio: A Review of the Evidence.” National Bureau of Economic Research Working Paper 24333, February 2018. Acs, Gregory, Laura Wheaton, and Elaine Waxman. 2018. Assessing Changes to SNAP Work Requirements in the 2018 Farm Bill. Urban Institute, May 2018. Aron-Dine, Aviva, Raheem Chaudhry, and Matt Broaddus. 2018. Many Working People Could Lose Health Coverage Due to Medicaid Work Requirements. Center on Budget and Policy Priorities, April 2018. Bivens, Josh, Elise Gould, Lawrence Mishel, and Heidi Shierholz. 2014. Raising America’s Pay: Why It’s Our Central Economic Policy Challenge. Economic Policy Institute, June 2014. Bolen, Ed, and Stacy Dean. 2018. Waivers Add Key State Flexibility to SNAP’s Three-Month Time Limit. Center on Budget and Policy Priorities, February 2018. Bureau of Labor Statistics (BLS). 2017. Annual Bulletin on Benefit Coverage: Bulletin 2787, September 2017. Bureau of Labor Statistics (BLS). 2018. “Union Members – 2017” (news release). January 19, 2018. Bureau of Labor Statistics, Current Population Survey (BLS-CPS). Various years. Data accessed through “One-Screen Data Search” tool, accessed July 2, 2018. Campbell, Colin, and S. Michael Gaddis. 2016. “‘I Don’t Agree with Giving Cash’: A Survey Experiment Examining Support for Public Assistance.” Social Science Quarterly, vol. 98, no. 5, 1352–1373. Cooper, David, Lawrence Mishel, and Ben Zipperer. 2018. Bold Increases in the Minimum Wage Should Be Evaluated for the Benefits of Raising Low-Wage Workers’ Total Earnings: Critics Who Cite Claims of Job Loss Are Using a Distorted Frame. Economic Policy Institute, April 2018. Foster, Ann, and Arcenis Rojas. 2018. “Program Participation and Spending Patterns of Families Receiving Government Means-Tested Assistance.” Monthly Labor Review, January 2018. Fremstad, Shawn. 2018. “No, Forced Labor Is Not Good for Your Health.” TalkPoverty (a Center for American Progress blog), January 19, 2018. Garfield, Rachel, Robin Rudowitz, and Anthony Damico. 2018. Understanding the Intersection of Medicaid and Work. Henry J. Kaiser Family Foundation, updated January 2018. Golden, Lonnie. 2016. Still Falling Short on Hours and Pay: Part-Time Work Becoming New Normal. Economic Policy Institute, December 2016. Hill, Heather. 2013. “Paid Sick Leave and Job Stability.” Work and Occupations, vol. 40, no. 2, 143–173. Hoynes, Hilary, and Diane Whitmore Schanzenbach. 2018. “Safety Net Investments in Children.” Brookings Papers on Economic Activity, March 8, 2018. Jarosz, Beth, and Amanda Lee. 2017. Majority of People Covered by Medicaid, and Similar Programs, are Children, Older Adults, or Disabled. Population Reference Bureau, June 2017. Lauffer, Sarah. 2017. Characteristics of Supplemental Nutrition Assistance Households: Fiscal Year 2016. United States Department of Agriculture, November 2017. Maestes, Nicole, Kathleen J. Mullen, David Powell, Till von Wachter, and Jeffrey B. Wenger. 2017. Working Conditions in the United States: Results of the 2015 American Working Conditions Survey. RAND Corporation. https://doi.org/10.7249/RR2014. Mastri, Annalisa, and AnnaMaria McCutcheon. 2016. Costs of Services Provided by the WIA Adult and Dislocated Worker Programs. Mathematica Policy Research, November 2015. Meyer, Harris. 2018. “Judge Blocks Kentucky’s Medicaid Work Requirement.” Modern Healthcare, June 29. Musumeci, MaryBeth, Rachel Garfield, and Robin Rubowitz. 2018. Medicaid and Work Requirements: New Guidance, State Waiver Details and Key Issues. Henry J. Kaiser Family Foundation, January 2018. Noon, James, Leticia Fernandez, and Sonya Porter. 2016. “Response Error and the Medicaid Undercount in the Current Population Survey.” U.S. Census Bureau Working Paper, December 2016. OECD. 2018. Employment Rate by Age Group (indicator). https://doi.org/10.1787/084f32c7-en. Rachidi, Angela. 2018. “The Truth about Medicaid Work Requirements.” American Enterprise Institute blog, March 20, 2018. Ruggles, Steven, Katie Genadek, Ronald Goeken, Josiah Grover, and Matthew Sobek. 2017. Integrated Public Use Microdata Series: Version 7.0 . Minneapolis: University of Minnesota, 2017. https://doi.org/10.18128/D010.V7.0. Schmitt, John, Margy Waller, Shawn Fremstad, and Ben Zipperer. 2007. Unions and Upward Mobility for Low-Wage Workers. Center for Economic and Policy Research, August 2007. Super, David. 2004. “The Quiet ‘Welfare’ Revolution: Resurrecting the Food Stamp Program in the Wake of the 1996 Welfare Law.” New York University Law Review, vol. 79, 1270–1397. U.S. Census Bureau, Current Population Survey Annual Social and Economic Supplement microdata (U.S. Census Bureau CPS-ASEC). Various years. Survey conducted by the Bureau of the Census for the Bureau of Labor Statistics [machine-readable microdata file]. Accessed July 23, 2018, at https://thedataweb.rm.census.gov/ftp/cps_ftp.html. United States Department of Agriculture (USDA). 2015. SNAP E&T 2014 Farm Bill Pilot Summaries, last updated March 20, 2015. United States Department of Agriculture (USDA). 2017. “SNAP Increasingly Serves the Working Poor,” (web page). USDA Economic Research Service, last updated March 14, 2017. Van der Noordt, Maaike, Mariel Droomers, Wilhelmina Ijzelenberg, and Karin Proper. 2014. “Health Effects of Employment: A Systematic Review of Prospective Studies.” Occupational and Environmental Medicine, vol. 71, no. 10. Waddell, Gordon, and A. Kim Burton. 2006. Is Work Good for Your Health and Well-Being? Report for the United Kingdom Department of Work and Pensions. London: The Stationery Office. Wall Street Journal Editorial Board. 2018. “The GOP’s Welfare to Work Pitch.” Wall Street Journal, June 5, 2018. Waters, Edward, and Philip Escoriaza. 2018. Brief for Deans, Chairs and Scholars as Amici Curiae in Support of Plaintiffs: Ronnie Maurice Stewart V. Alex Azar. United States District Court for the District of Columbia. Wilson, Valerie, and Janelle Jones. 2018. Working Harder or Finding It Harder to Work: Demographic Trends in Annual Work Hours Show an Increasingly Fractured Workforce. Economic Policy Institute, February 2018.